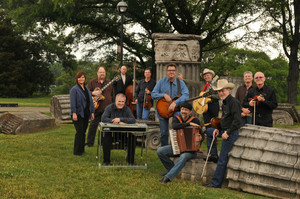 The band’s current, self-titled release on Rounder Records has been nominated for two Grammy Awards – Best Vocal Performance by a Duo or Group–Country, and Best Country Album. Just recently, The Time Jumpers were named one of the artists in the Nashville Scene’s 13th Annual Country Music Critics’ Poll. The band is featured in both the Album and Duos and Groups categories. The Time Jumpers was established in Nashville in 1998 by a group of first-rate studio musicians who wanted to spend some spare time jamming with their equally gifted buddies. The notion of building a rabidly devoted following was the last thing on their minds, but that’s exactly what happened. As word spread along Music Row that something special was happening, big stars began dropping by, some to sit in with the band, others just to enjoy the vast array of country, swing, jazz and pop standards The Time Jumpers rejoiced in playing.